Christmas to me has always been a magical time. When we were growing up, my mother always had cookies, sugared fruit, a Hershey kiss tree, and all kinds of candies. She would have orange peels and cinnamon sticks simmering on the stove as we came home from school. The Oakridge Boys and Dolly Pardon Christmas music were always being played along with Jimmy Dean’s, “Yes, Virginia – there is a Santa Clause.” The ornaments on our tree were all handmade by her, each lined with velvet cloth, and beads of all varieties with tiny push pins. She even had hand sewn stockings for each of us. One of the sweetest things I ever witnessed my mother do was during Christmas time. She decided to write out a very touching letter describing Christmas to her first cousin who had recently lost his eye sight due to diabetes. She had heard from other family members that he was in deep sadness and was having a hard time “moving on.” She was distraught that his eyes would never gaze upon the splendor of Christmas ever again. To her, never “seeing” Christmas was almost unbearable. When she told me what she was doing, – I sat down (as a thirteen year old) with her at the kitchen table, as she thought of each thing in our house that embodied Christmas. She eloquently described every Christmas detail including the evergreen tree, the cookies, the stockings, and the den with a mountain of presents. She wrote, then erased and wrote and erased, trying to make everything just so. She detailed the brilliance of the lights and even described us three children running around with sparkles in our eyes. She described each little candy and cookie with perfection so much so, that I could close my own eyes and see it all like it was the first time. I thought she was the best writer I had ever seen. I felt so much admiration towards her in that moment. It was one of the most thoughtful things I’d ever seen anyone do. I remember her rushing to the mailbox to get that letter to him as soon as possible. It almost seemed to both of us, that there was something magical about that letter. Maybe we thought it would change his circumstances. Maybe we wanted that letter to somehow give him his sight again. Christmas day came four days later and my mother received the call that her cousin had passed away early that morning. We wondered, “Had someone read him that letter?” Then at the funeral, we found out that the letter had been read aloud to him but he was so sick – it was unlikely he actually heard it. I know my mom was secretly disappointed because I was. That letter wasn’t magical after all. 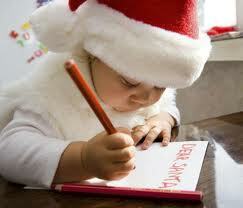 It had all the magical words that one might mention during the holiday season. It had all the imageries of the picture-perfect Christmas scene. It was beautifully written as though my mother had been schooled by the finest English professors. Today, I have my own children. I play Christmas music for them too and simmer orange peels and cinnamon sticks to fill the house with the wonderful holiday smells. My tree is adorned with beautiful ornaments that represent pieces of our lives. It stands nine feet tall and glistens with approximately four thousand clear and colored lights. It’s my turn to bake cookies, candies and make gingerbread houses. It’s my turn to fill the stockings and take pictures of the children. It’s my turn to take notice of the sparkles in my boys’ eyes as they anticipate Christmas morning! Most importantly though, I think about what my mother did twenty-nine years ago almost to the day. I think about sitting there with her at the kitchen table throwing out ideas hoping to make a difference too. It was what she did that caused me to admire her then so dearly. She reached out to someone that was so hopeless and showed him love. This truly is the sweetest letter, Kimberly, and the sweetest message to us is the truth of the hope of eternity because of Jesus! God has gifted you to be able to touch hearts with words. Thanks for writing! Merry Christmas to all of your family! Kim, you truly have a gift, thanks for sharing and reminding me again what Christ-mas really is all about.